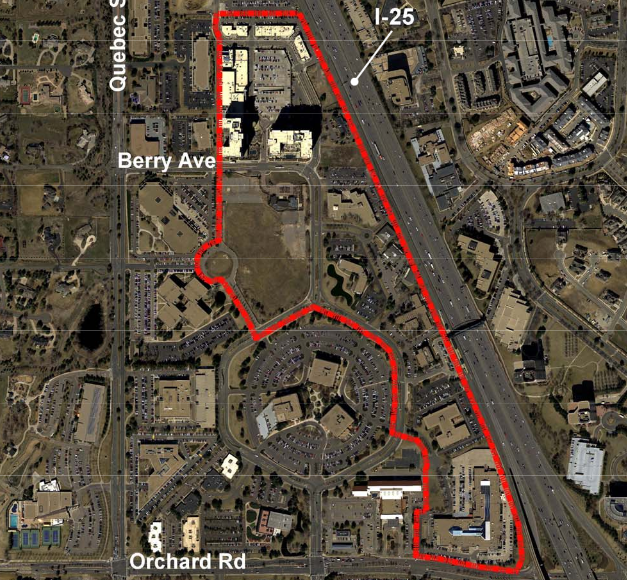 Greenwood Village Voters: A Walkable Community? Not in Our Backyard! 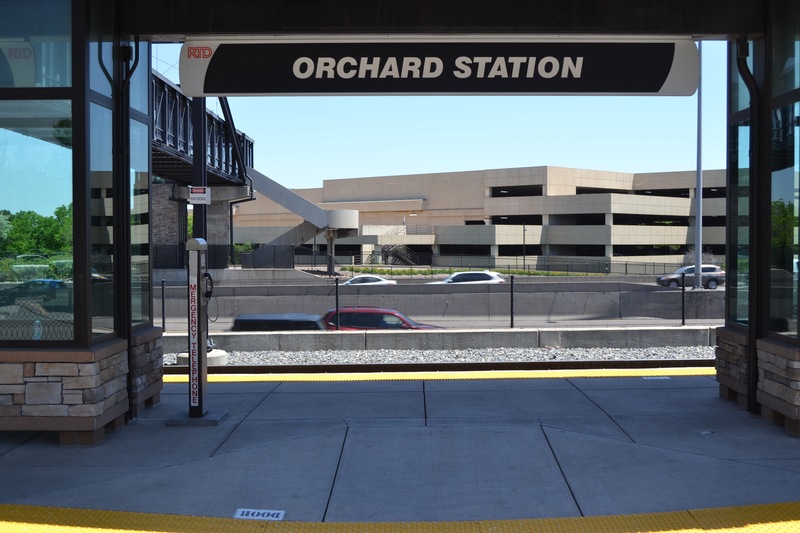 In March, the Greenwood Village City Council decided they’d let voters dictate whether the Orchard RTD light rail station should anchor a walkable neighborhood. In a special election Tuesday, residents shot down the idea of building homes and businesses within walking distance of each other. They would rather continue with their familiar auto-centric sprawl. So Presley’s preferred “city” consists of sprawling parking craters, disconnected streets, and missing sidewalks. There’s no room for more people, according to him, but the hordes of cars funneling into Greenwood Village from I-25 are just fine. Transit stations aren’t just locations where people board a train or bus. They work best when they enable people to make all sorts of trips without driving. Creating those types of travel patterns depends on the development around the station. Around Denver’s 10th and Osage Station, for instance, housing, shops, restaurants, a park, and community assets like a rec center mix together. You can reach a lot of places on foot, and if you want to head downtown you can just walk to the train and hop on. That’s not the case in Greenwood Village, where sprawling office parks and parking lots dominate. It’s hard to walk anywhere, and after this vote, that’s how things will stay for the foreseeable future. While I completely disagree with their decision, how would this have helped current residents in a meaningful way? I don’t think it would, just future residents. Walkable density doesn’t necessarily mean giant towers. My neighborhood is way denser that anything in Greenwood Village and nothing is over 4 stories, most buildings are 2 or 3. It would provide more tax revenue to the city, possibly easing the property tax burden of current residents. Also providing more nearby businesses and jobs for people in the area. It would have increased the tax base and created a new area with restaurants and shops for existing residents. It probably would have provided additional, paid parking for the light rail, too. The RTD lot is tiny. The existing tax base is beyond ample. Living near there, I’m a short bike ride away from great sushi, pho, Greek, Persian, several choices of Indian, burgers, and even some good Mexican (plus lots more bad Mexican). It was going to add more parking pressure than parking spaces, and the nearby Arapahoe station always has plenty of open spots for commuters. So, from a strictly self-interested viewpoint, there’s no “there” there. That was a big part of the problem with the proposal. You disagree with the residents vote to stop high density development. You ask the question how would voting yes have helped the current residents. The answer is that greater efficiency in use of alternate transport other than cars generally benefits the area and the world pollution problems. Voting to address these huge issues our society is facing would demonstrate concern for the future residents of, well, everywhere. Is that something the people of GV share a concern for? Obviously not. I count myself in the camp that wanted the high density new approach development to go forward. It would sacrifice the suburban character and I think that is good. Wow, this was a pretty short sighted article… Way to ignore the facts and pick and choose pictures. I walk and ride all around with my kids and it is great. A more positive slant would be that light rail stations benefit from more intense development that activates a walkable area nearby. Greenwood Village voters expressed a much broader philosophical view unrelated to the station Certainly Orchard Rd (on both sides of the freeway) reflects more of a road less traveled. Yes, it’s a very nice area. Do you walk around the station area, which is what was this is about, or are you talking about Greenwood Village in general? The pictures here are very representative of the station area. This vote was for the Comprehensive Plan for all of GV.. this area was only used as a driver to change the whole plan. So just looking at an undeveloped spot right at the station is pretty unfair. The issues that the residents have are much different than you are expressing and to say ‘Scaremongering’ and giving a really weak reference is a misunderstanding of the situation and vote as a whole. The difference was population density (apartments)… that is the argument of residents who voted against it. Oh god! Not apartments! In view of million dollar homes! Well, whether you agree or not.. at least you are getting to the actual reason why it was voted down instead of writing articles on walk-ability. So why not write an article and address the real issues? That I would support and probably even be on your side. Density of homes and businesses is part of walkability. You need places to walk to. 1. Here you are standing on the sidewalk that leads in and out of the station. The bus stop is right next to you. You decided to turn and take a snapshot of a parking lot of a private business. 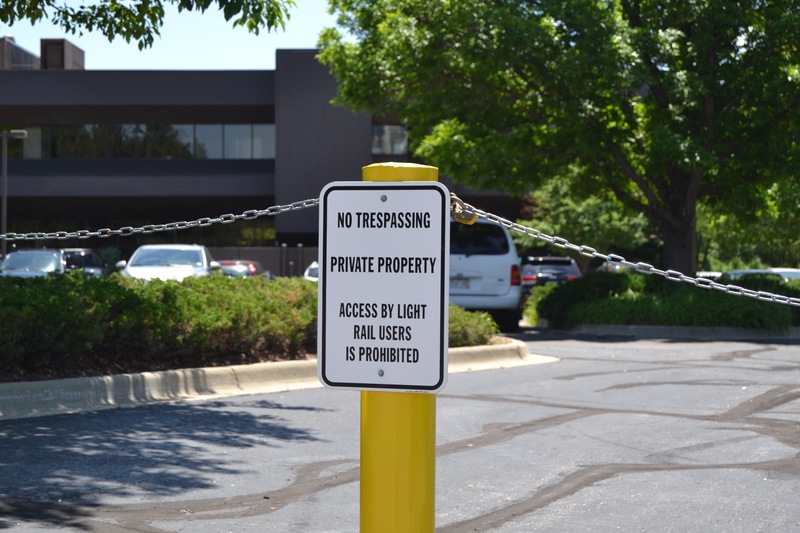 There would be no reason to walk through the parking lot, as it only leads to that business. 2. You are literally standing at the bus stop and 5 ft behind you is the cross walk that leads to everywhere. 3. This is a private parking garage for that business on the other side of I-25. 4. I ran around for 10 minutes and couldn’t even find these stairs… what I did find was lots of railings (not just in the station), really nice sidewalks, elevators for the cross-over, and proper handicap entrance ramps all over the place. I ran to the station and was NEVER off a sidewalk. Just a bit absurd for you to shape your story like this. 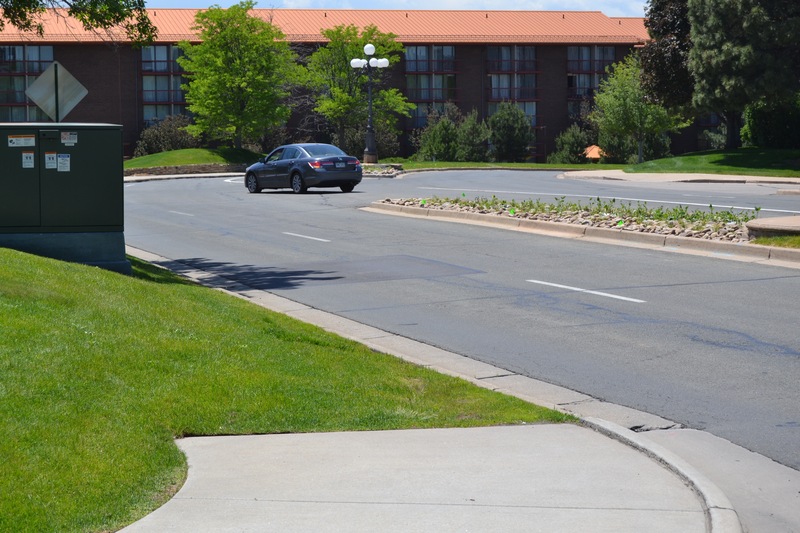 Whether you agree with the vote or not, your argument of no-walkability is just not there. Walk north (toward the station) on the east side of Greenwood Plaza Blvd, and that’s where you’ll find that missing sidewalk. It’s also clearly visible in aerial shots. When I last walked to that station, that’s the route I took (it seemed most direct), and I promise I wasn’t going out of my way to find problem spots. If you’re walking with a destination, carrying bags (work materials in my case), and not running for exercise, it makes sense to try to find a direct route, and walking all the way out to a street that’s not a direct route to anything is a hassle. But the east side of I-25 wasn’t included in the plan, so none of that is especially relevant here. Every path or sidewalk system has it’s nuances, where you must cross the street, go around a building, or otherwise take a non-direct route. I lived in Uptown before this.. walking to downtown and even there this sort of stuff happens. My point here was that the pics were intentionally mis-leading. The pictures reflect what I saw walking through this area well before I’d read anything about this plan. 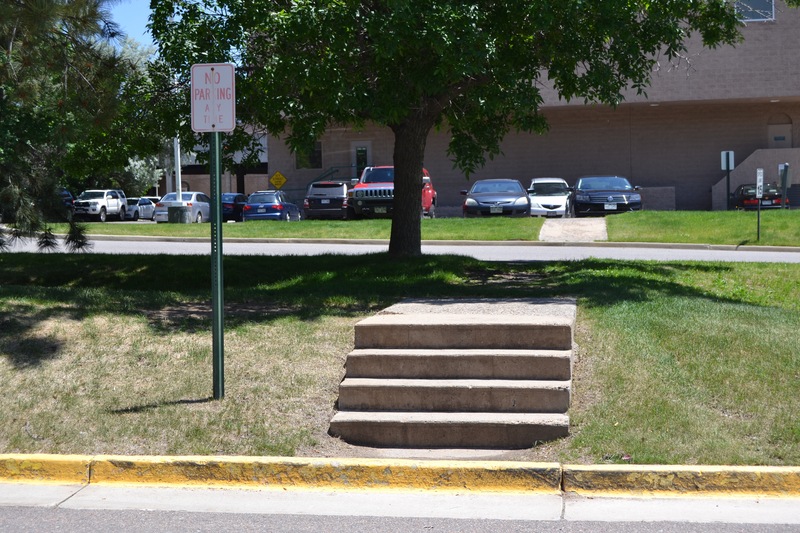 Fixing sidewalk connections and making sure that if you’re presented with a stairway there’s an accessible option within view is basic stuff in any neighborhood. Wandering around looking for the right route to take to get where you’re going isn’t something we usually expect people driving cars to have to do (and even when we do, well, they’re in climate-controlled armchairs on wheels, so it’s still not equivalent.) This goes double when you’re using a wheelchair — having to guess whether turning left or right will get you to someplace you can proceed really stinks. Missing sidewalks are not the only thing that makes a place unwalkable, and there are plenty of missing sidewalks in that area. Places to walk to, at distances that are reasonable to walk are also needed. There is very little there, and even less within a tolerable distance on foot. A complete waste of land for a transit station. The train is too expensive…. I barely ever took it. The AAA estimates say that it costs 58 cents per mile to operate a car. Of that 58 cents, you’re only paying around 11 cents in gas. The other 47 cents goes for expenses like insurance, maintenance, and depreciation. Additionally, The average passenger vehicle emits about 411 grams of global warming CO2 gases per mile or about 4.7 metric tons of carbon dioxide per year. You’re not costing out the full transaction. In addition to deadindenver’s points about accurately measuring your own travel costs, mass transit moves more people at lower total cost, which show up in things like lower taxes or money available to spend on other development. it would be smart to develop a workable, attractive plan that gave GV residents more incentive to use the light rail. This plan just wasn’t that plan. The residents had valid concerns that the TOD would take away from the character of the neighborhood. The plan was open-ended and did not address matters important to EXISTING residents – including view corridors, public safety issues, significant road projects required to meet increased capacity due to heavy development, School District class size increase, and other significant changes increased density would have on the current community. The development plan sets the broad direction and vision for the area, but it did not address the infrastructure issues above. Development will most likely occur eventually, but I do understand the reasons the residents did not approve the current plan. I found this vote disappointing. I’ve had to visit buildings near Orchard Station a few times for work, and it’s an unpleasant area to walk in. The office buildings immediately next to the station seem to be mostly empty, with the most traffic going to the drug screening office. On a visit to Greenwood Village City Hall a few weeks ago, I took the Call-and-Ride from Orchard Station, but it was more trouble to line up a ride back, so I walked back to the station. It’s just under a mile, and for the most part the sidewalks were adequate (except where they’re preempted by parking lots or just inexplicably missing for a stretch right by the station). As far as I could tell, there aren’t existing residents in the area that would be affected by this plan. Replacing a bunch of underused, unattractive old office buildings and their poorly-designed parking lots would’ve been a great move for Greenwood Village and for anyone who’d like to visit and spend money there. There’s probably a good market for “Keep Greenwood Village Bland” bumper stickers. You are still not understanding the reason why it was voted down… it was voted down for the population density increase and the fallout problems on the community and infrastructure from that, not because people want the area to stay boring. Because people fundamentally misunderstand the effects of density. I hardly think there is any consensus, even among the most respected experts, on what the effects of density are. There are way too many variables that change due to attitudes and geography… hence why you can only find white papers that show examples. Overall, sounds like a blank statement that can’t be backed up. You’re right, there are a lot of other variables. Most of the problems people associate with “density” are rooted in other things. Check the timestamps on these comments; that was the first thing I posted, so “still” isn’t quite right for this. Residential use is already an encouraged use in the Corridor Planning Area, so I hope that something makes it through even without the amendment to the Comprehensive Plan. So you visited here a ‘couple of times’ and you hope that something goes through, even though it was voted against 3-1… stop trolling. Pretty sure one vote doesn’t mean we’re stuck with old half-empty office buildings in that space forever. I work nearby, and if there were anything there to visit, I’d be happy to do so. It’s a real problem that few of the restaurants or other post-work destinations in the south I-25 corridor are near light rail stations. I haven’t assumed you’re arguing in bad faith, and I’d appreciate the same courtesy. It was a vote against development and urbanization. It was a vote for protectionism and against the future. I get it. The existing residents are okay with what they have right now and want to protect that. It will take a larger scale change in thinking of the American lifestyle and what our overall values are before people vote for development in their own backyard. It won’t happen overnight and until then you can expect more gastric bypasses and less walkable development. Hope you got a decent chunk of change to write this propaganda piece. GV is 8 square miles. Modifying a couple of dozen acres would do nothing beneficial for current residents (aka the voters) and create impossible congestion for the thousands of residents that use the Orchard interchange daily. For proof, just go north one exit and see what high density construction has done to the Belleview interchange. As for taxes, that’s a joke. More services would be required. Did you know GV spends almost double on police per capita than any other municipality in the region? Let the GV Board trim some waste on the operating departments, put up a few less holiday decorations on the thoroughfares, and they’ll have plenty of money. Low density. Lot of area to cover, few residents paying taxes. Same thing with all the city’s infrastructure. Ridiculous. It’s an affluent community where all property owners pay RE taxes and all residents pay sales taxes. Every government jurisdiction faces the same issues without the amount of overspending on frills that goes on in the GV budget. No one is going to move out to GV and not have a car, unless you want to turn large chunks of GV into Denver. GV residents do not want this. That’s why they live here. And yes, we do not want this out of place development in our backyards. The proposal lost 3-1. Whether people own cars or not was not my point. You said they spend more per capita. They have a large area to cover with few people in it. That leads to having to spend more per person. Sure, if they are rich they can pay more per person, so maybe they’re ok with that. Reality is each person in GV has to be able to pay for a larger share of the city’s infrastructure and services because there is a large area to serve with few people. Are you implying someone paid David Sachs to write this? Who would do that and to what end? While I don’t believe David was paid to write this… don’t be fooled in thinking that an entity wouldn’t (like Alberta Development). The ends, I am sure you can figure out. I think if you follow Streetsboro you would see that his message is clear and organic. No need to defame him just because you love cars. I was agreeing with you about David… so not sure what you are on about. Sorry, thought you were the OP. My bad. 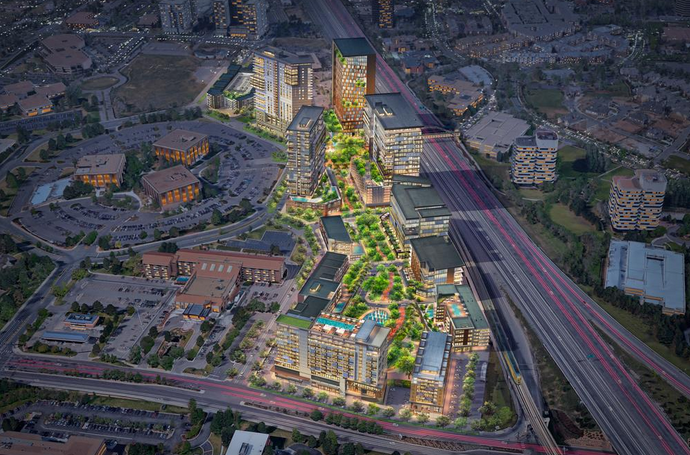 There are large parts of Denver proper that are very walkable that would be similar to what could be developed at this site under the current plan. RiNo and LoHi aren’t packed with 20 story buildings and those areas are delightful and walkable. If people want 20 story buildings they should probably live downtown. People move to Greenwood Village because of the schools and the suburban atmosphere. Did people really expect a vote for a stack of 20 story buildings would win? The developer is out to maximize profit, they don’t care about the impact of adding several thousand people and they certainly don’t care about what it would do to traffic. And the tax impact of this development would be minimal. Who would trade 50$ in property tax for 5,000 more cars at the Orchard exit? Only an idiot. Most neighborhoods in metro Denver would do the same if polled. I guess anti development is a reasonable choice. But the tech center area has more jobs and offices than downtown Denver so trying to say it is not urban is fantasy. Trying to protect the view across the interstate where there is also a train station is just ridiculous. That type of protectionism is common in GV with the resistance also trying to shut down the local airport. Good luck with that, NOT. I recently moved out of Greenwood Village after living there for 3 years. In these past 3 years the area has changed so much. Instead of the slow-paced quiet neighborhoods, the roads have become highways with people speeding and having little regard for others walking or biking. I rode my bike to Orchard or Arapahoe station everyday and there are still weighted lights that skip over me in favor of the weigh of car traffic. Cars do not give 3 feet of space and honk at me repeatedly for even being on the road even though I purposely chose roads that are 35 mph or less to avoid traffic. Voting for not changing the existing model of development will not keep the area quiet and peaceful or reduce the volume of traffic. Why? Because this area has already become busier and less friendly for walking and biking. On the other hand, narrowing the streets around orchard and arapahoe stations, putting in bike lanes and small local businesses might make the area safer. I’m not advocating for high rises, because this will not make the area better. What I do want is small 1-2 story multi-use development that will slow down traffic on these side streets like Peakview, Caley, Syracuse, Greenwood Plaza. These roads should be comfortable, interesting and feel safe for all modes of transportation. What a nightmare of a place.